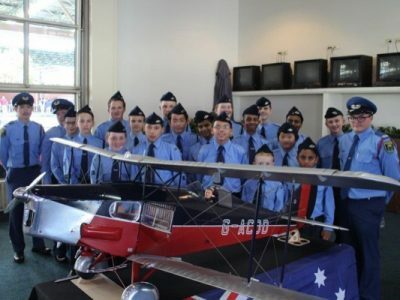 Sandown Park Raceway, Melbourne became known for another form of racing earlier this year as it played host to theModel Aeronautical Association of Australia (MAAA)’s second Annual Formula 1 Air Race. In their official roles as Pylon Marshals and Lap Counters, the cadets were also given special access to get up close to the action, including access to the pits and flight line and also provided the crowd with a small demonstration of their skills in drill. The day’s air racing came to a spectacular conclusion with the mid-air collision of 2 aircraft during the final race. Travelling at over 200kph, the both aircraft quickly turned into very expensive confetti that littered the track below. The cadets were soon engaged in helping clear the balsa and plastic wreckage from race track and surrounding area. Aside from the excitement of the air racing, the MAAA also offered the crowd a glimpse at a range of other model aircraft and other remote controlled cars, dragsters, tanks and boats, many of which were actively on show throughout the day. A personal favourite was the 1/16th scale Fairchild A-10 Thunderbolt tank-busting jet which was quite a sight as it made simulated ground attack runs down the length of the racetrack. A small AAL information stand also provided the public with an opportunity to learn more about the League and also get to meet some cadets and officers. Keen interest in this was shown by several members of the public resulting in a number of follow up enquiries being made to squadrons. The Australian Air League Victoria Group would like to thank both the Model Aeronautical Association of Australia and Coco Events Australia for allowing us to participate in the 2016 Formula 1 Air Race at Sandown.